The saddest documentary I watched this year was called The Paw Project. I turned it off after 5 minutes watching footage of crippled leopards and lions in zoos after having their nails removed. After a few days I managed to compose myself and tuned in again to watch The Paw Project to the end. It actually turned out to be a very positive doc with real results being made towards the banning of this diabolical practice. It highlights real facts that I am sure most cat guardians, who have had this done to their cats, did not realise. I have a good friend from the US who obtained her cat from a shelter which did the declawing and she also had no idea what declawing actually meant. She assumed it was having the nails removed, not any part of the bone! 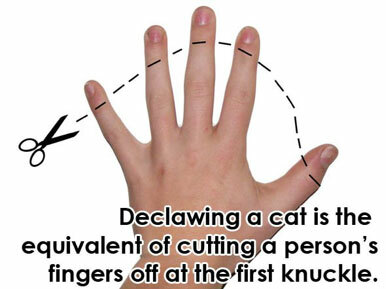 Declawing is a violent, invasive, painful, and unnecessary mutilation that involves 10 separate amputations—not just of cats’ nails but of their joints as well. Its long-term effects include skin and bladder problems and the gradual weakening of cats’ legs, shoulders, and back muscles. Declawing is both painful and traumatic, and it has been outlawed in Germany and other parts of Europe as a form of cruelty. Many veterinarians in the U.S. refuse to declaw cats, who experience extreme pain when they awaken after surgery and have difficulty walking until their paws heal. Without their claws, cats are virtually defenceless. Some stop using their litterboxes. Sensing their vulnerability, some cats become paranoid and develop neuroses. Others who escape the safe confines of home are left completely vulnerable to predators and abusers. Scratching does not cause a problem if cats’ nails are trimmed properly. Scratching posts and consistent guidance about where they may scratch also help cats learn not to scratch furniture or other inappropriate items. I encourage anyone who cares about cats to watch this documentary and to speak about it with family and friends. You can also like their FACEBOOK page here. I am proud that the UK have made the practice of declawing cats illegal.